Infused with Canadian maple sugar, Maple Baby is naturally sweet and satisfying. Spread liberally on a muffin or dollop a spoonful onto a bowl of oatmeal or pancakes. 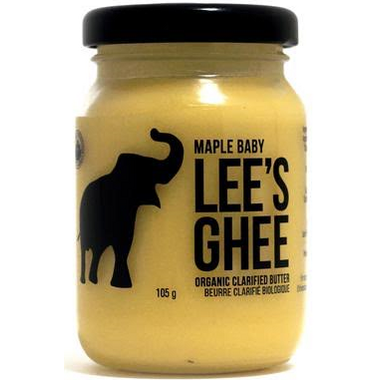 Ghee: better than butter! Ingredients: Organic butter, organic maple sugar. Excellent product! I love the taste, its very smooth with the perfect amount of sweetness. I use it for making matcha every morning. Add 2tsp of this ghee with 1tsp of matcha and you have the best bombproof matcha out there!! This is the first time I've tried ghee. I thought it might be nice for pancakes, but I'll stick to regular butter and maple syrup. The jar was quite small for the price.